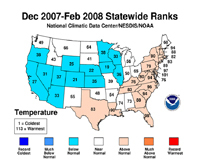 The average temperature across both the contiguous U.S. and the globe during climatological winter (December 2007-February 2008) was the coolest since 2001, according to scientists at NOAA’s National Climatic Data Center in Asheville, N.C. In terms of winter precipitation, Pacific storms, bringing heavy precipitation to large parts of the West, produced high snowpack that will provide welcome runoff this spring. A complete analysis is available online. In the contiguous United States, the average winter temperature was 33.2°F (0.6°C), which was 0.2°F (0.1°C) above the 20th century average – yet still ranks as the coolest since 2001. It was the 54th coolest winter since national records began in 1895. With higher-than-average temperatures in the Northeast and South, the contiguous U.S. winter temperature-related energy demand was approximately 1.7 percent lower than average, based on NOAA’s Residential Energy Demand Temperature Index. Winter precipitation was much above average from the Midwest to parts of the West, notably Kansas, Colorado and Utah. Although moderate-to-strong La Niña conditions were present in the equatorial Pacific the winter was unique for the above average rain and snowfall in the Southwest, where La Niña typically brings drier-than-average conditions. During January alone, 170 inches of snow fell at the Alta ski area near Salt Lake City, Utah, more than twice the normal amount for the month, eclipsing the previous record of 168 inches that fell in 1967. 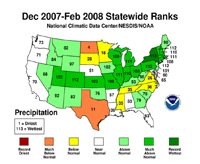 At the end of February, seasonal precipitation for the 2008 Water Year, which began on October 1, 2007, was well above average over much of the West. Snowfall was above normal in northern New England, where some locations posted all-time record winter snow totals. 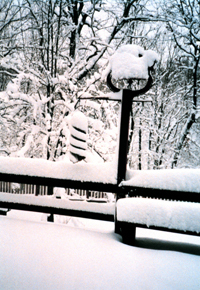 Concord, N.H., received 100.1 inches, which was 22.1 inches above the previous record set during the winter of 1886-87. Burlington, Vt., received 103.2 inches, which was 6.3 inches above the previous record set during the winter of 1970-71. While some areas of the Southeast were wetter than average during the winter, overall precipitation for the region was near average. At the end of February, two-thirds of the Southeast remained in some stage of drought, with more than 25 percent in extreme-to- exceptional drought. Drought conditions intensified in Texas with areas experiencing drought almost doubling from 25 percent at the end of January to 45 percent at the end of February. WWhile analyses of the causes of the severe winter storms in southern China continues, NOAA Earth System Research Laboratory scientists are focusing on the presence of unusually strong, persistent high pressure over Eastern Europe, combined with low pressure over Southwest Asia. This pattern directed a series of storms across the region, while northerly low level flow introduced cold air from Mongolia. Unusually high water temperatures in the China Sea may have triggered available moisture that enhanced the severity of these storms. While there has been little trend in snow cover extent during the winter season since records began in the late 1960s, spring snow cover extent has been sharply lower in the past two decades as global temperatures have increased. February was 61st warmest in the contiguous U.S. and 15th warmest globally on record. For the U.S., the temperature was near average, 0.2°F (0.1°C) above the 20th century average of 34.7°F (1.5°C), which was 2.0°F (1.1°C) warmer than February 2007. Globally, the February average temperature was 0.68°F/0.38°C above the 20th century mean of 53.8°F/12.1°C.